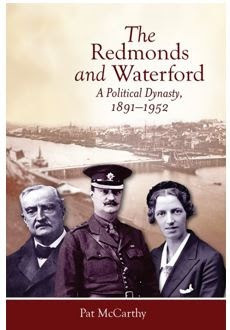 Waterford County Museum: “We always vote Redmond in this house” - The Redmonds and Waterford, a political dynasty 1891-1952. A Lecture by Dr Pat McCarthy. “We always vote Redmond in this house” - The Redmonds and Waterford, a political dynasty 1891-1952. A Lecture by Dr Pat McCarthy. Waterford County Museum are delighted to welcome back Dr Pat McCarthy for this most informative talk on the Redmond’s. This is sure to grab the attention of all. The Redmond family dominated Waterford politics for sixty years. John Redmond represented Waterford at Westminster. He also represented the County in Leinster House. Redmond resigned his parliamentary seat in Wexford to fight Parnell’s old seat in Cork but was decisively beaten in the by-election. He went on to challenge Michael Davitt in a bitter electoral struggle in Waterford. The Waterford people supported him until his death. After his death John Redmond’s son William, held the seat, and was returned in the General Election that year. It was the only seat won by the Irish Parliamentary Party in the South of Ireland - a testimony to the enduring bond between the Redmonds and Waterford. Elected to Dáil Éireann in 1923, he formed and led the ill-fated National League in 1926 and after the demise of that party he joined Cumann na nGaedheal. After his sudden death in 1932 he was succeeded by his widow, Bridget. For almost twenty years she worked tirelessly for her constituents and also played a role on the national stage in Dáil Éireann. Pat McCarthy’s book on the Redmonds is a wide-ranging study, and offers a new insight into the political career of John Redmond and his family. Pat who is by now no stranger to Dungarvan, is a native of Waterford City, holds a PhD and an MBA from UCD and worked for many years in the pharmaceutical manufacturing sector. He is the author of The Irish Revolution, 1912–23: Waterford (Dublin, 2015) and Waterford and the 1916 Rising (Waterford, 2016). His talk takes place at the Dungarvan Harbour Sailing Club on Wednesday the 17th of October at 8pm. There will be an entry fee of €5 and as always, all are welcome, bring along your book for Pat to sign!